Neonatal Jaundice is a condition in which the skin of a new born baby changes to yellow. This change in the colour is due to excessive amount of a substance called ‘bilirubin' in the blood. Yellow discolouration is also seen in the white part of the eyes. Bilirubin is formed when our body breaks down the old red blood cells. This bilirubin is then processed and removed by the liver. In new born babies, the liver is not capable of processing large amounts of bilirubin, so its level increases in their blood stream. 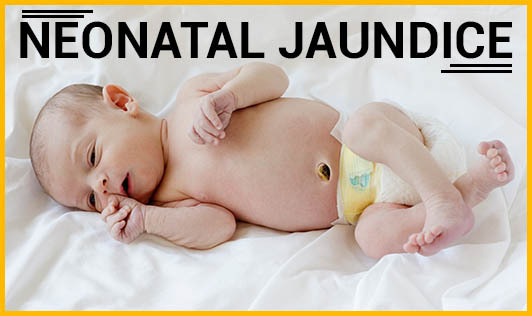 There are different causes for neonatal jaundice. • Physiological Jaundice: This shows up between the first 2 to 3 days of birth; and is usually not harmful. Bilirubin is slightly on the higher side in most of the new borns. • Breast milk Jaundice: This type of jaundice appears due to certain factors present in breast milk which slows down the breakdown of bilirubin in the liver. It may last for about a month. • There are other causes like sepsis, infections, hepatitis, G6PD deficiency, etc; which might be alarming. Generally, all new born babies are tested for any signs of jaundice after the first 24 hours. Treatment is not required in most cases, as jaundice regresses on its own. The mother is asked to keep the baby well hydrated by breastfeeding frequently. But if the bilirubin levels are too high, the treatment to lower the same is started immediately. It may include phototherapy.